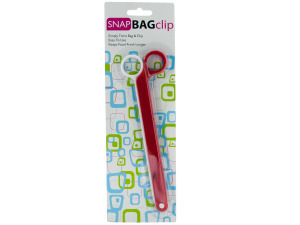 Simply twist up a bag of chips or other food and clip it with this 8" Snap Bag Clip to keep it fresh longer. Wide 8" scissor-style clip will keep bags airtight and your foods tasting fresh and delicious. Comes packaged in a hanging blister pack. Package measures approximately 11" x 3.5" x 0.5".